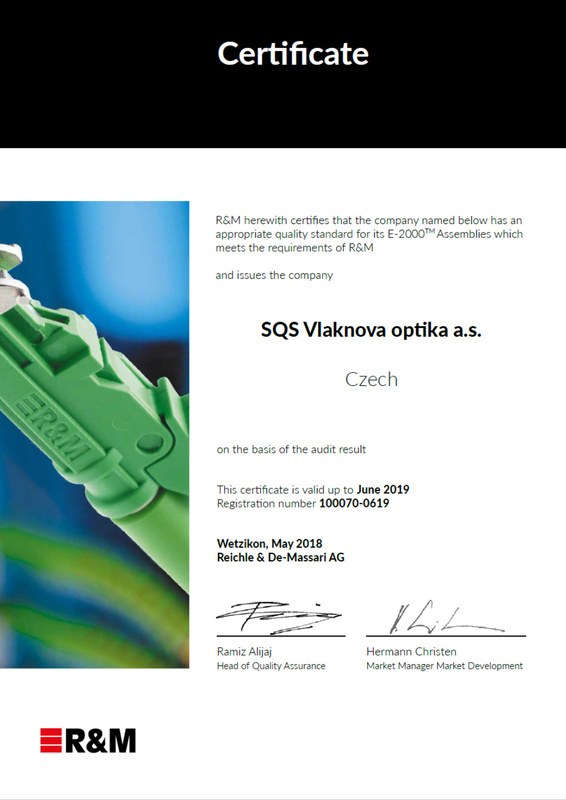 SQS has acquired not only widely recognized ISO certification including quality and environmental management systems according to ISO 9001:2015 and ISO 14001:2016 standards, but also very demanding certification proving that we have established and applied a quality management system for Assembling and Testing of Semiconductor Parts according to IATF 16949 for delivery to automotive industry. 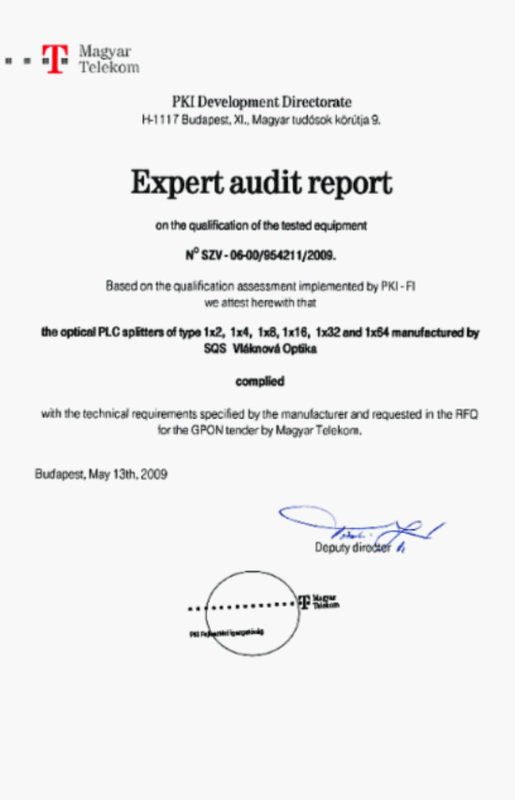 Another very important proof of our high quality standards and uncompromised quality management are customer audits. 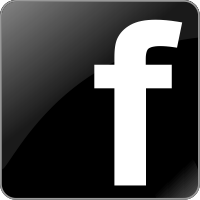 We have met audit requirements by the following organizations: Deutsch, JDS Uniphase, Diamond SA, Gooch&Housego, Litef, Alcatel-Lucent, Tyco, BMW, TÜV SÜD. 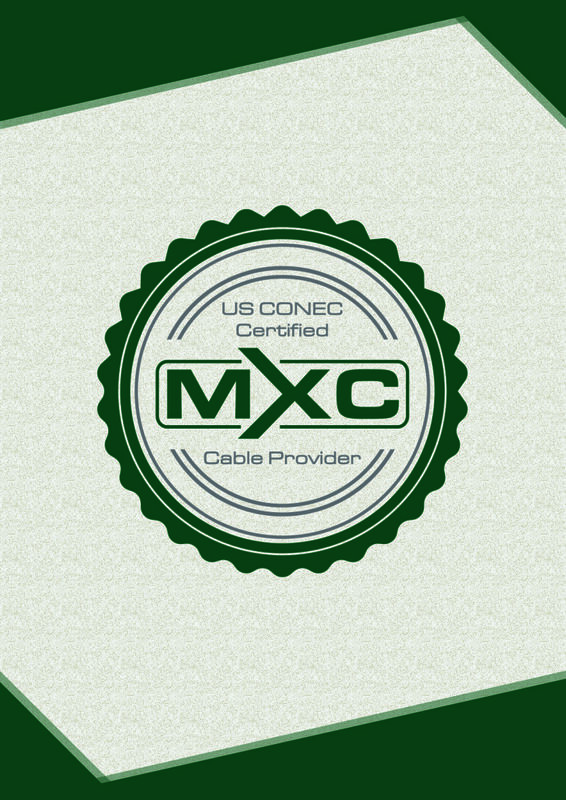 Our customers include a wide spectrum of companies not only from the telecommunications industry but also from many other industrial sectors where fiber optics finds still more and more applications. This is especially so-called integrated optics, i.e. optical components developed for integration into larger units like modules, devices or equipment for various applications using the data transmission in the form of optical signals, such as optical measurement instruments and systems, sensors and sensory systems in power engineering, mechanical engineering , chemical, petrochemical, mining, automotive industries, in health care for various diagnostic systems, and in many other applications. An important objective of our company is to serve the needs and requirements of our customers to the best that is possible to offer. Customers are the very centre of our interest because their satisfaction inspires co-operation between them and SQS leading to success and prosperity of our company. 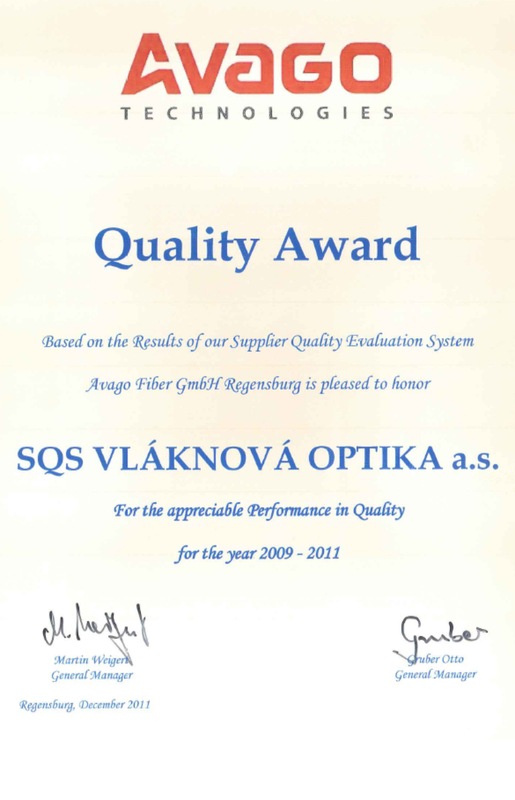 Since the very beginning the focus on quality has always been a factor of success and competitiveness for us. 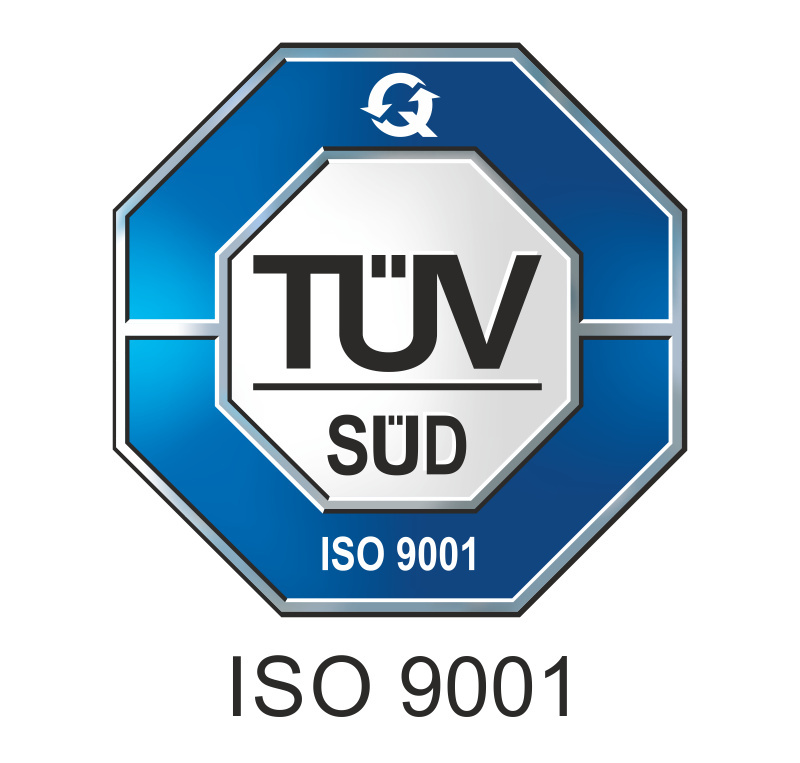 For this reason, the quality management system according to ISO 9001 had been introduced into SQS, and first certified in 1998. The quality management system of our company is focused on the prevention of non-compliance and on increasing the effectiveness of all processes, from the very planning of product development to servicing our products during their application at customers’ sites. 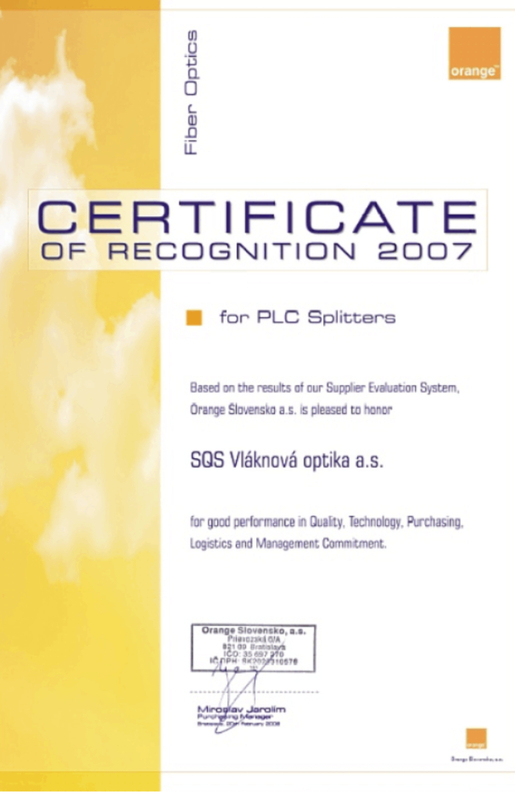 The quality management system (based on ISO 9001:2008) was recertified in 2010 and extended to the division of optoelectronics and sensors. 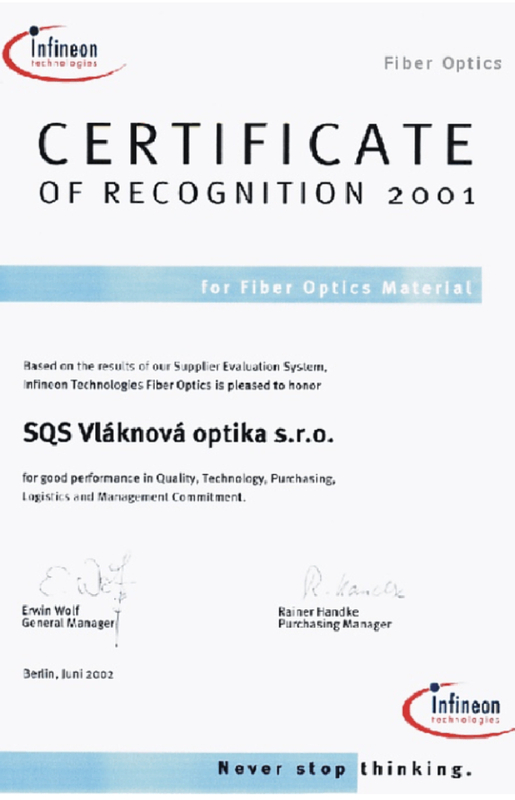 Scope of the quality management system ISO 9001, development, production and sales of fiber optic interconnecting devices, active and passive components. Assembling and testing of semiconductor parts. 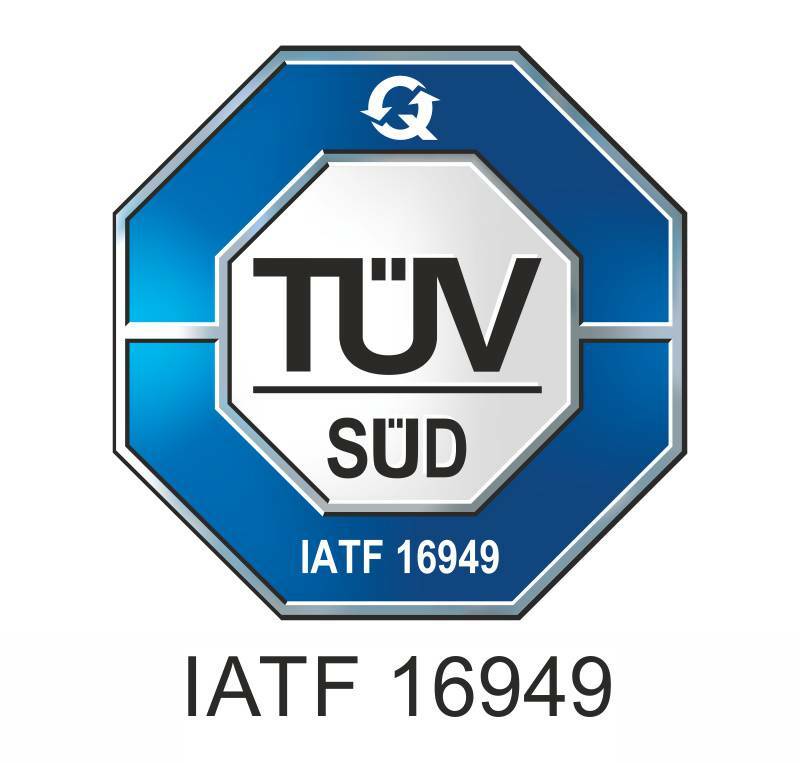 Scope of the quality management system IATF 16949, assembling and testing of semiconductor parts, (without Product Design as per Chapter 8.3). 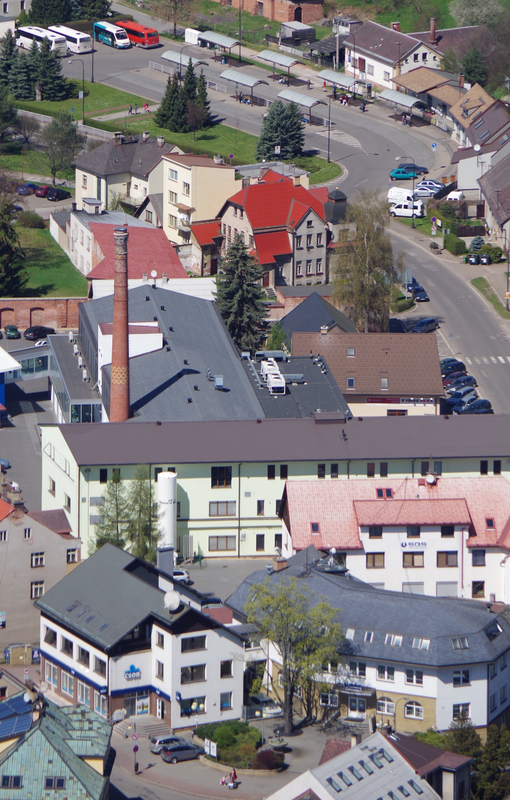 Environmental protection measures, care for health and security of our employees have become our priority goals, and an integral part of our company standards. We endeavour to constantly improve all processes in order to minimize negative environmental effects that our production processes may have. We constantly take measures to decrease consumption of energy sources. 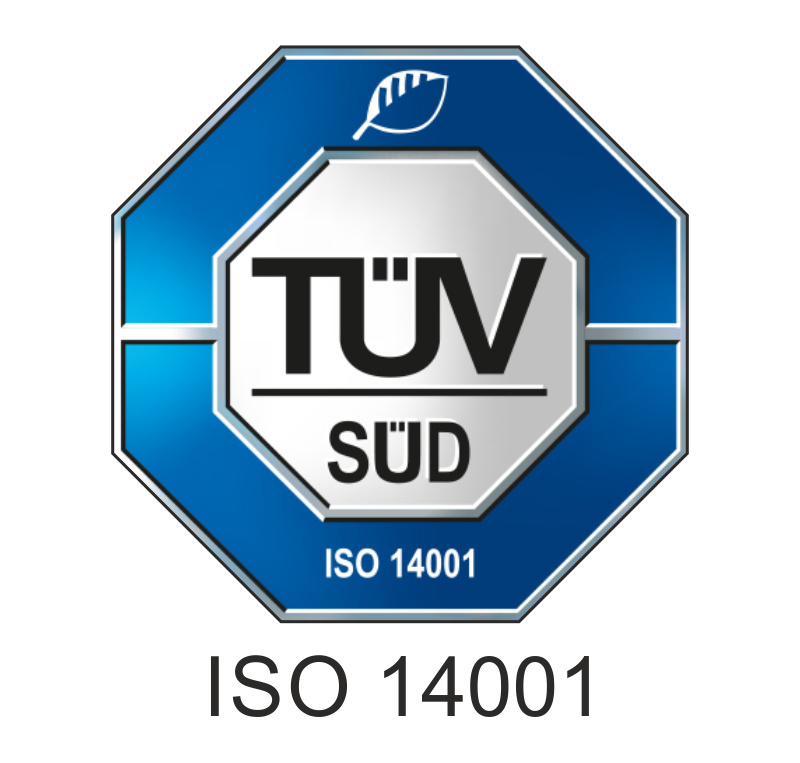 The system of environmental management has been integrated into our company's quality management systems based on ISO 14001, and first certified in 2001. The system of environmental management has been recertified according to ISO 14001:2016 in 2018. 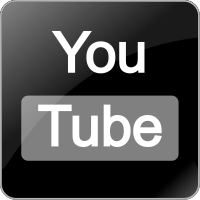 Development, production and sales of fiber optic interconnecting devices, active and passive components. Assembling and testing of semiconductor parts. 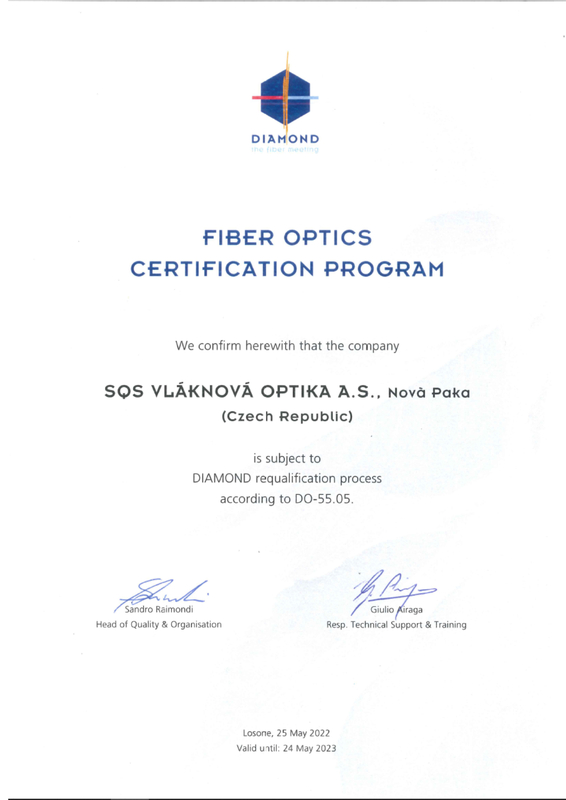 SQS Vláknová optika a.s. fully supports the objectives of Dodd-Frank Wall Street Reform and Consumer Protection Act 2010 (“Conflict Minerals Law”), which aims to minimize violence and environmental damage in the Democratic Republic of the Congo (DRC) and surrounding countries. 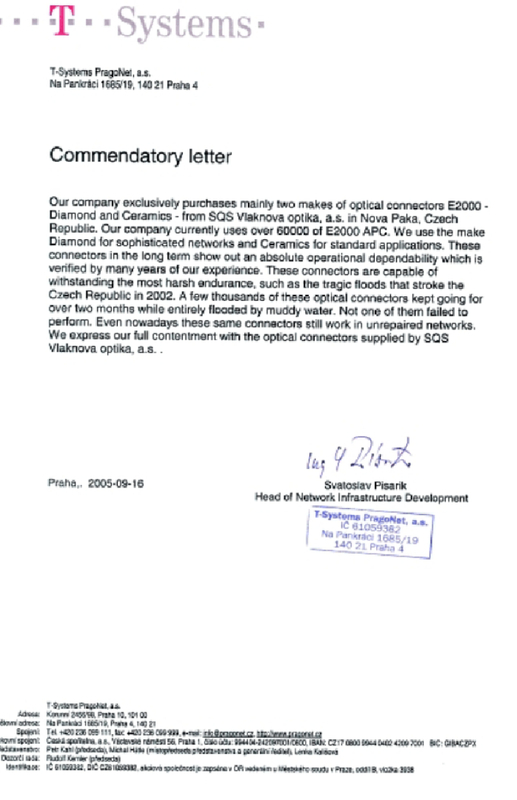 SQS Vláknová optika a.s. does not directly purchase any Conflict Minerals from any source and does not knowingly procure any product containing Conflict Minerals from the Conflict Region. 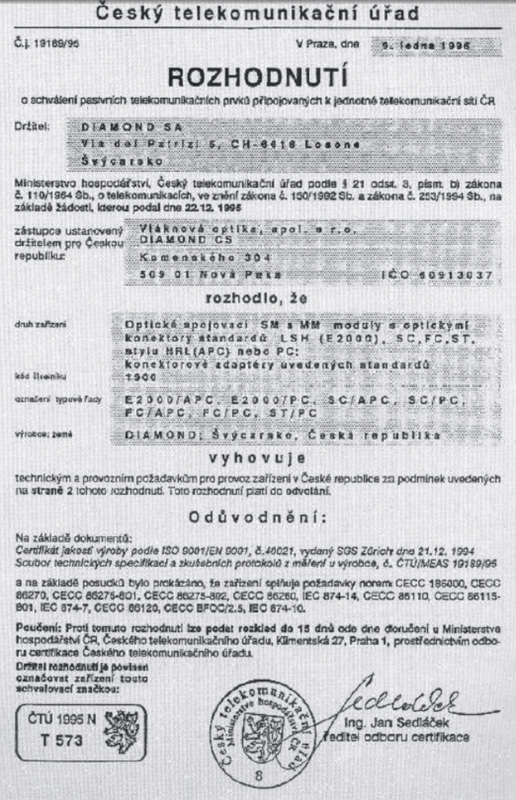 SQS Vláknová optika a.s. expects that all suppliers comply with Conflict Minerals Law and provide all necessary declarations using the EICC / GeSI Conflict Minerals Reporting Template. These measures will be used in conjunction with industry initiatives such as the Conflict-Free Smelter Program to reasonably assure that the Tantalum, Tungsten, Tin or Gold in the products we manufacture do not directly or indirectly finance or benefit unauthorized armed groups in the DRC. In addition, we have also reviewed our existing supply base, in particular suppliers of materials that contain “conflict minerals”. 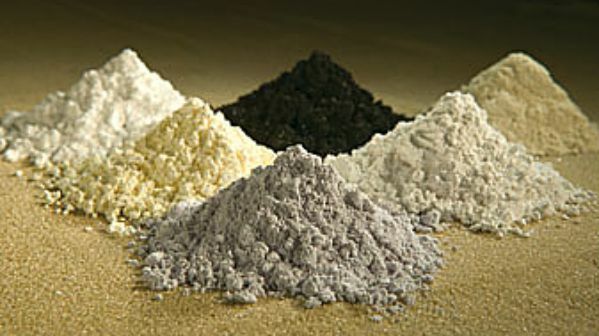 We can confirm that at this time there is no indication that any products we manufacture contain minerals that directly or indirectly finance or benefit armed groups in the Covered Countries. 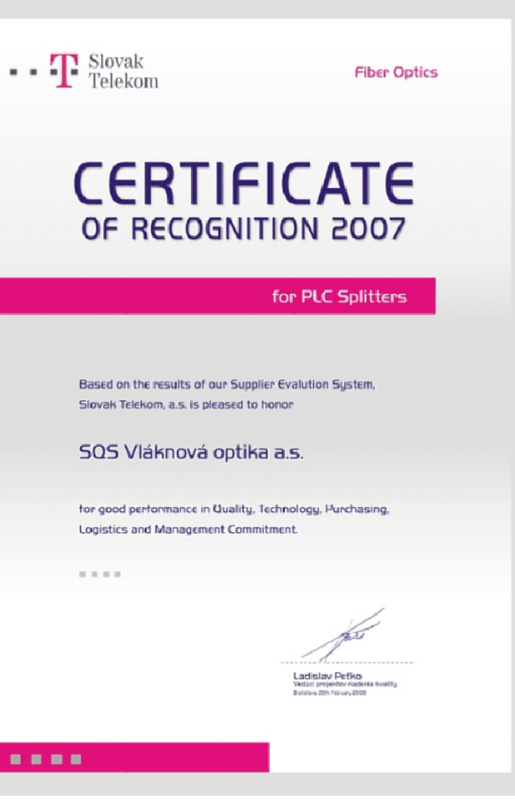 SQS Vláknová optika a.s. will assess future business with suppliers who are noncompliant with this policy. 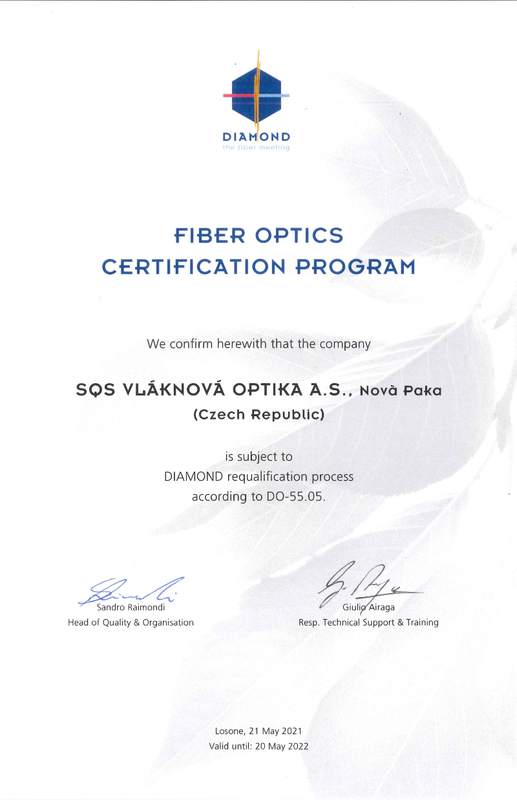 SQS Vláknová optika a.s. will work with its supply chain to increase transparency regarding the origin and traceability of minerals contained in products. Our packaging is compliant with European Parliament and Council Directive 94/62/EC on packaging and packaging waste.